Larry Summers For Treasury Secretary? Summers was an awfully controversial guy a couple years ago. And the things that made him controversial will all be revisited if he has to sit through a Senate confirmation hearing. 2. He's loyal, to a fault. One of the main things that turned Harvard's faculty against Summers was the case of his protege Shleifer. Shleifer ran a Harvard-affiliated, USAID-funded office in Moscow in the 1990s that advised the Russian government on economic reform. The U.S. government later sued Harvard and Shleifer, charging that the operation was overrrun by conflicts of interest. Summers recused himself from direct dealings with the case, but in his epic dissection of the saga for Instititutional Investor, David McClintick charged that Summers did try to shield Shleifer. Harvard and Shleifer lost the suit, and Harvard had to pay $26.5 million in damages and Shleifer $2 million. I can't get as worked up about this as some people (if we could force Harvard to give the government even more money, maybe Barack Obama wouldn't have to raise your taxes), but I also know and like Andrei Shleifer, so I'm really not the best judge. 3. He's a callous right-winger. Summers' academic mentor was conservative economist Marty Feldstein, and he worked for Feldstein at Ronald Reagan's Council of Economic Advisers in the early 1980s. Paul Krugman worked there too, so that really isn't saying much. For most of the 1980s, in fact, Summers was an outspoken skeptic of financial markets and their ability to set prices rationally and steer investment wisely. As he rose to positions of power in Washington in the 1990s, though, he became a leading defender of the Washington consensus--the idea that free financial markets, free trade and fiscal discipline would bring prosperity to the world. Lately Summers has been partially reconsidering that stance in his columns for the Financial Times. If you're favorably disposed to him, as I am, you could say he's been pulling a Keynes: "When the facts change, I change my mind." But I guess if you're not so favorably disposed, you could call him a closet right-winger, a closet left-winger, or a slave to fashion. Anyway, I'm sure Larry Summers would make a very good Treasury Secretary. Again. I don't know about you, but I'm not feeling it. We've seen exactly what kind of mess is wrought by these rightwinger ideas of "free markets", I don't think we can afford to spend any more time disproving those theories. Matt Stoller isn't buying it either, and has created a petition to ask President-elect Obama to consider someone else. The Washington Note is reporting that former Clinton official Larry Summers is one of the leading nominees to become the Treasury Secretary for the Obama administration. In 1999, Summers was one of the key proponents of the banking deregulation that led to the rise of 'mega-banks' and the current financial crisis. 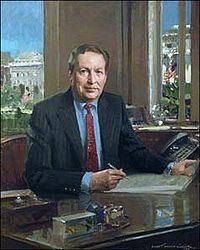 At the time, Senators like Byron Dorgan and policy advocates like Public Campaign were warning the financial deregulation, but Summers did not listen. In addition to this remarkable lapse in judgment, Larry Summers has argued that women are innately less gifted in science than men, that 'Africa is Underpolluted', that child sweatshop work in Asia can be justified, and that energy used to oppose job destroying trade agreements was "very, very badly mispaced". Who else? Jon Corzine, Sheila Bair, or Laura D'Andrea Tyson, for starters.